- Beam Steel, Uk 4318 X 312 X 2.7 Mm. Type A Uk 1800 X 178 X 76 X 6 Mm. Type B Uk 1800 X 175 X 75 X 4.5 Mm. Type A, Uk 350 X 178 X 76 X 6 Mm. Type B, Uk 350 X 175 X 75 X 4.5 Mm. - Sleeve Beam Or Terminal End Section (Beam Cover Strip), Uk 2.7 X 725 Mm. 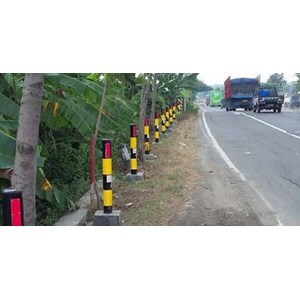 - Reflector Sign (Cat's Eye) Diameter 100 Mm With Sticker 3M Color Red Or Customized. - Mushroom Bolt (Bolt Mushroom), Uk M16 and M16 X 45 X 35 Mm Mm And Hexa Bolt M16 X 35 Mm + Nut And Washer. - Steel Plate Used Was Type Hot Rolled Steel Plate Production Pt. Krakatau Steel (Persero). - Coated Hot Dip Galvanized (HDG) According to standard ASTM A-123 That Serves As Anti Corrosion Coatings For Long Term. 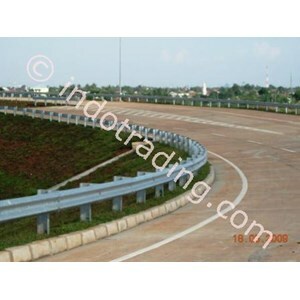 - Guardrail Products (Safety Fence Road) We Have Been Getting Recommended Equipment Companies The Way Of The Directorate General of Land Affairs.